This is fun. Look out, Cary Grant. Here is the patch for version 2.0 If you are downloading the aircraft after 2:30 pm EST today you will not require it. This patch corrects texture issues identified in YoYo's post #125 on page 5. It also updates the tool tip for the spray activation and adds a "Clear Prop!" call out to the engine start sequence (courtesy of YoYo) If you don't want that delete SND20 in the Stearman folder found in the main sound folder. NOTAM - Aircraft fuel system - It reflects the FAA approved real world solution to high fuel consumption with the 450 Pratt This is referenced in the aircraft reference document that may be accessed in the a/c knee board. Please review so you can be assured that there is nothing wrong with your model and you are aware if you run the fuel level to zero indicated. Except for aircraft certified under the Restricted category as crop dusters or sprayers prior to October 11, 1950, the maximum takeoff and landing weights are 3,200 pounds. Because aircraft modified under these standards did not come from the Boeing/Stearman factory, there is no factory published performance data. The performance data listed below was determined by actual flight testing done in this or a similarly modified airplane. Because the Pratt & Whitney engine can burn significantly more fuel per hour than the stock Continental, Lycoming, and Jacobs engines, some customers had requested that to add an auxiliary fuel tank when the conversions were being done. There is no provision in the airplane's Type Certificate Data Sheet for an additional auxiliary fuel tank, the solution was to secure a "field approval" from the local FAA FSDO to install a 20 gallon "header" tank. This is reflected in the model you have. Please understand that a header tank is not an auxiliary tank per se. It is a tank plumbed in line between the airplane's main fuel tank and the carburetor, usually intended to maintain "head" pressure to the carburetor. For this reason, it is important for the operator to remember these three important points. 1) There is no separate position for the header tank on the airplane's fuel selector valve. When the fuel selector is in the ON position, fuel flows from the main tank through the header tank until the main tank is empty, after which the engine burns the fuel in the header tank. 2) There is no way to fill the header tank directly. When fuel is loaded into the main tank, it flows through the main tank into the header tank until the header tank is full, after which the fuel fills the main tank. 3) There is no fuel quantity gauge for the header tank. The FAA was very specific on this point; adding a fuel gauge would void the approval for the installation. The only fuel gauge in the airplane measures the quantity in the main fuel tank. When the fuel gauge reads EMPTY, the only fuel remaining is the fuel in the header tank. Depending upon how much power you are pulling, this should give you enough fuel to fly for approximately 1:00 to 1:15 before all fuel is exhausted and the engine quits. The model will be uploaded to the SOH file library by weeks end. Last edited by Spad54; December 31st, 2018 at 13:47. Looking good Spad54! Computer build complete... loving it! Now downloading FSXSE... 4 days... real crappy internet speeds on my end. Anyways Happy New Years Team Gas!!! Thx Paul for thorough explanations about fuel system! 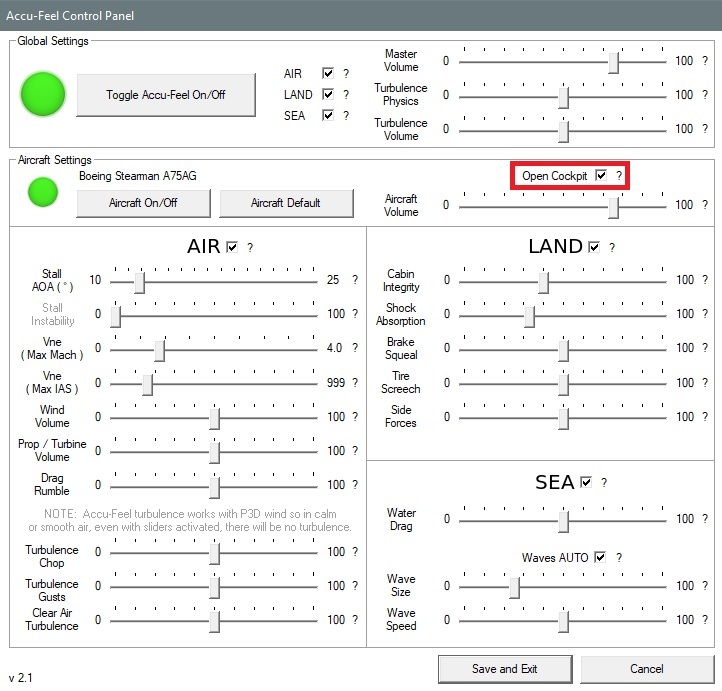 For users of Accu Feel (P3Dv4.4 also) - don't forget tick in settings Open Cockpit. It adds more immersions for this bird . I just noticed this fine aircraft has an autoinstaller. As I like to keep track of what is installed where in my FSX, I have always been more comfortable doing a manual install route for most aircraft (esp. beta test etc. ), where possible. Does anyone know how to go about installing this ac manually ? I remember reading somewhere a long time ago about setting up a fake FSX folder and pointing the autoinstaller to it, then just manually moving the files to the real FSX folder, but cannot remember the details of how to do this ? Okay create a folder on your desktop or any other safe place you wish. Note the file location. Start the installer select FSX and when prompted direct the installer to your safe place. When satisfied run the installer. After that it up to you to place all the parts in the right place and you own the outcome. Don’t come. back to us for errors. You do it you own it. you might want to bump up your 'wind volume' and 'prop/turbine volume' near max too - pilot is sitting 'outside' after all..
Before this thread closes I wanted to thank GAS for the great Stearman DEMO. And thanks to YoYo for the paint. It's really great. No complaints on this end. The enclosed pic is of me flying our Stearman on one of the many scenic flights I do. I feel like I owe and apology for the "testy" response to a few posts. I offer no excuse other than it was at the end of a long day and I probably should have waited before responding at all. Thanks gain for all your kind words and the overall participation in the project. The model is now on the SOH file library and the link posted in a dedicated thread and contains all the updates and is complete. The links in thread are being taken down. If you like this just wait for the full project release. Have fun take care. Last edited by Spad54; January 2nd, 2019 at 07:19. 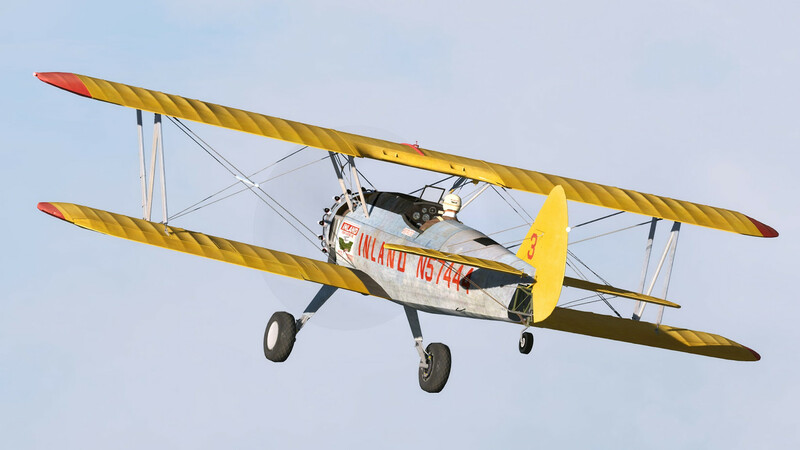 Just a heads up, guys: if you ever hear pronounced tire screech in a real Stearman, you done messed up bad, and the next thing you hear will be the string of curses flowing from your own mouth as you come to rest in the ditch. You simply can't fly the real airplane in a way that generates screeching tires. As always, adjust your own sim to your own liking, though. yeah - I just want to hear a chirp to go with the bump of touching down on asphalt or concrete...Accu-Feel gives me the ability to make that happen. The old Cherokee I have flown in always had a clear chirping of the mains as they went from dead still on touchdown to the 70mph or so landing speed. That's ok and much appreciate all that you are doing with this project. It fits my style of flying and better than I expected. Also thanks for taken in consideration of hearing our expressed wishes!